Other details:In 1935 the Japanese Army massacred Xiawujiazitun, Jinxi County, Liaoning Province. Houses in the village were burned, 378 persons were killed, and over a dozen people in my family were killed or burned to death. We demand Japan to give compensation. After liberation, the village built a memorial hall to educate the younger generation. I am a retired worker from Jinzhou Ceramics Factory, Liaoning Province. I was born in Xiawujiazi Village, Gangyaoling Town, Jinxi County, Liaoning Province. The other day, I read an article entitled “History Is Not Forgotten” from Reader’s Digest [Editior’s note: This is not the Reader’s Digest in the West.] (published in October 1992). 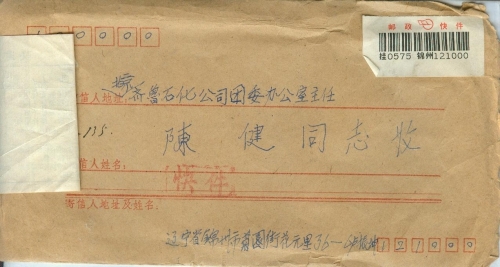 From the article, I came to know your names and that you had been working on demanding reparation from the Japanese government for the Chinese victims. I was deeply moved by your efforts. I am a victim of Japan’s war of aggression against China. Before dawn on lunar October 24, 1935, the Japanese army massacred Xiawujiazi Village, Jinxi County, Liaoning Province. Ten of my family members were innocently killed and burned to death, and our 14 houses were burned down (See the attachment for details). Although it has been more than half a century since the massacre took place, I never forget the atrocities that Japanese invaders inflicted on our Chinese people. 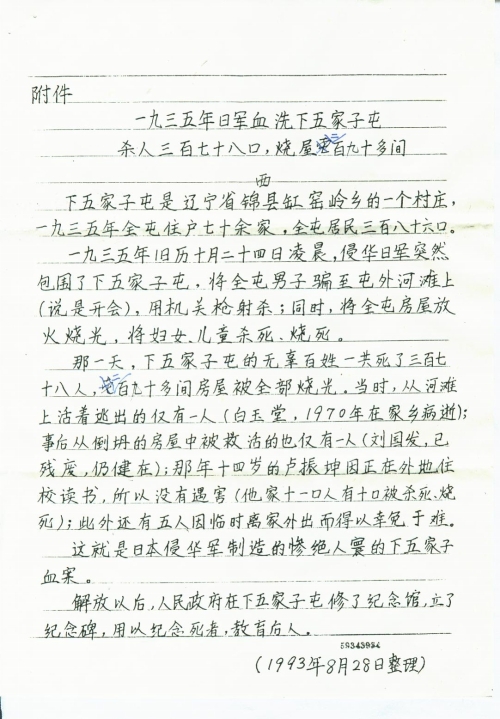 As a Chinese victim, I demand reparation from the Japanese government according to international law. I sincerely ask you for help. I am willing to participate in your signature campaign. The Japanese army massacred Xiawujiazi Village in 1935, killing 378 people and burning over 290 houses. Xiawujiazi Village is a village in Gangyaoling Town, Jinxi County, Liaoning Province. In 1935, there were over 70 households and a population of 386 in the village. Before dawn on lunar October 24, 1935, the invading Japanese army suddenly surrounded Xiawujiazi Village, deceived all men into going to the beach outside the village (using the lie of holding a meeting) and shot them with machine guns. Besides, they set fire to all houses in the village, killing and burning to death the women and kids. On that day alone, 378 innocent people from Xiawujiazi Village were killed and over 290 houses were burned down. Only one man (Bai Yutang, died of illness in his hometown in 1970) survived the massacre at the beach. Another man (Liu Guofa, disabled and still alive) was saved from the collapsed houses. 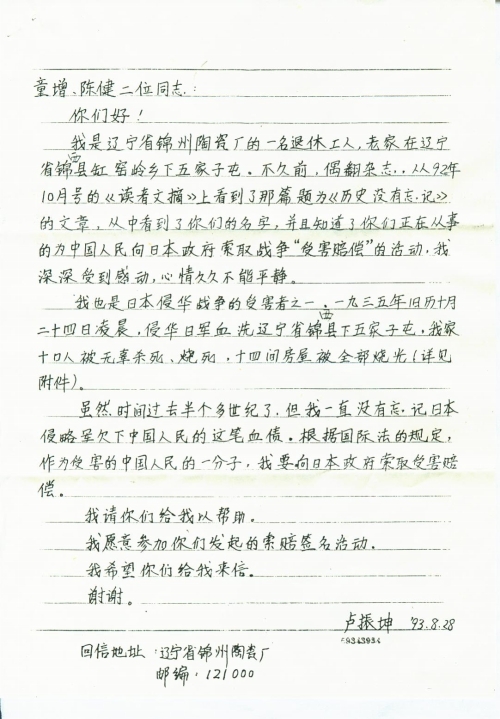 Lu Zhenkun, 14 years-old, survived because he was going to a boarding school which was located far away from the villiage (but 10 of his11 family members were killed or burned to death). Another 5 people survived because they were not there. This is the Xiawujiazi Village Massacre committed by the invading Japanese army. After the Liberation in 1949, the Government built a memorial hall and a monument to commemorate the dead and to educate the future generations.